The summer is here and your dogs are starting to have all sorts of problems from fleas, skin allergies to shedding. This means your summer dog care costs are also going nowhere but up. As a fellow dog owner, I would like to share with you some summer dog care tips as well as some of the cheaper alternatives to name brand dog care products. One of them being a cheap Frontline Plus Alternative. Let’s start with fleas and ticks, it is a common problem that many dog owners are facing in the summer time with their canines. Fleas and ticks can latch on to your dogs coat and cause many diseases such as Lyme. Fleas can set off allergies and skin conditions such as rashes in dogs. People do not usually even think about this problem during summer unless they see that their pet is seriously suffering from it. It is important to know that fleas can pass on diseases to humans as well. It is especially important when you have little children at home constantly playing with your dog. There are many commercial products for these problems but the one I prefer most is PetArmor which is an alternative to the more expensive Frontline Plus for Dogs. PetArmor contains the same ingredients as Frontline but is half the price. You can get a three month supply of PetArmor for $28 from Walmart. 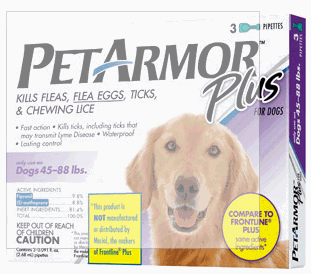 PetArmor takes care of adult fleas and flea eggs as well as chewing lice. This product is waterproof so it will last longer on your pet’s coat. Switch to the cheap Frontline Plus solution and save money today! Expensive alternatives to this product include Front Line Plus & K9 Advantix II. Being indoors all winter can leave your dog with dry skin and shedding follows in the summer months. If you have a low maintenance dog such as a Boxer or a Pit Bull, you can save money by doing some grooming at home. Simply mix olive oil and baby shampoo to shower the dog then brush them thoroughly afterwards. You can also get a hypoallergenic conditioner which will leave the coat smooth and smelling great. If you have a dog that require medium to high grooming such as a Cairn Terrier then it is best to visit your local Petco and get the Basics package. You can then save money by doing the maintenance at home. As the weather gets hot so does many of the allergies. Warm weather is pollen time! Your dogs like humans can be allergic to pollen. Allergies can present itself from rashes to nasal and eye discharges. Sneezing and itching is also symptoms of allergies. Watch out for signs of excessive licking of the dogs feet. Allergies can be treated with antihistamines although medications prescribed will depend on the severity of the allergen. Keep a close eye on your dog for any swelling or irritation around the eye and temporal area. Do not change your dogs food during summer months if you never had a problem with the food, doing so may cause allergic reactions from the food. You can then confuse these symptoms with summer dog allergies. I am blessed to have a Pit Bull Terrier with very few health problems. 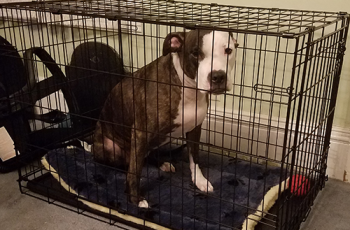 She is now reaching 2 years of age and I have always kept her on Purina SmartBlend Dog Food.